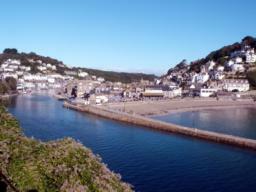 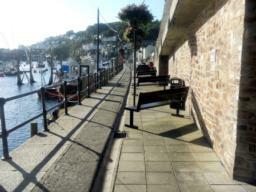 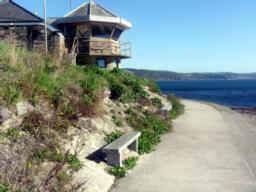 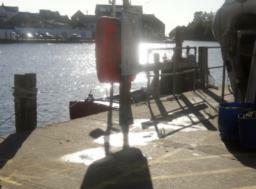 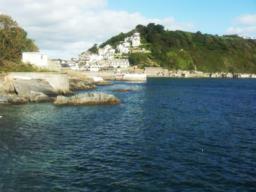 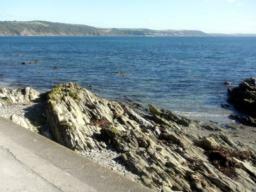 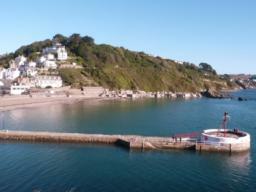 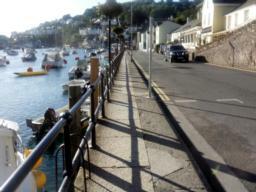 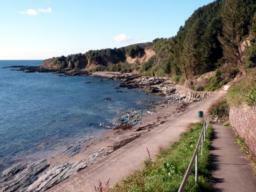 From the large car park at Millpool, through West Looe, out to Hannaford Point and beyond. 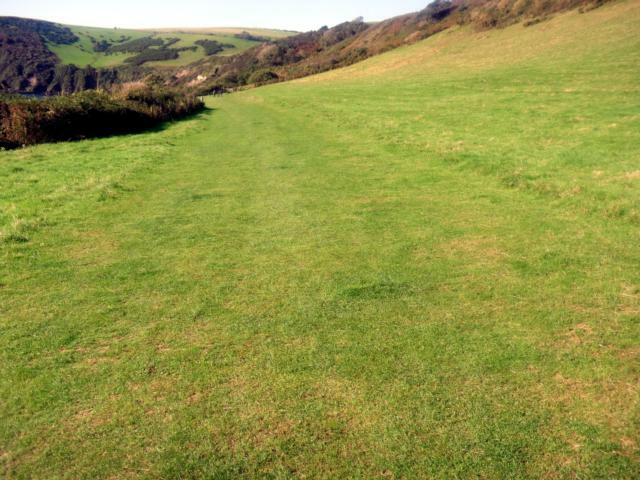 This is a gentle, mainly level walk on good surfaces. 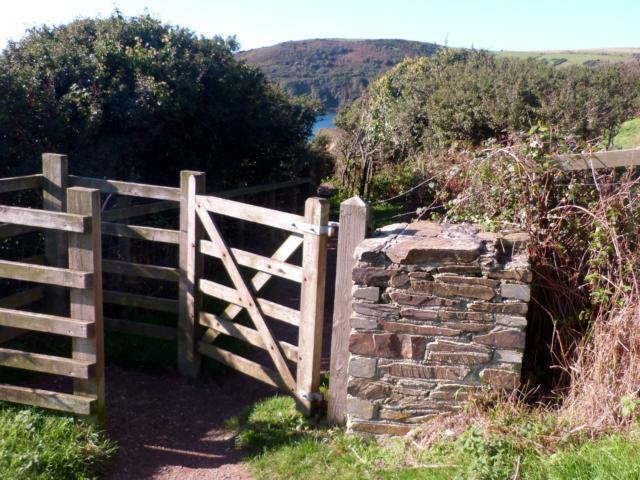 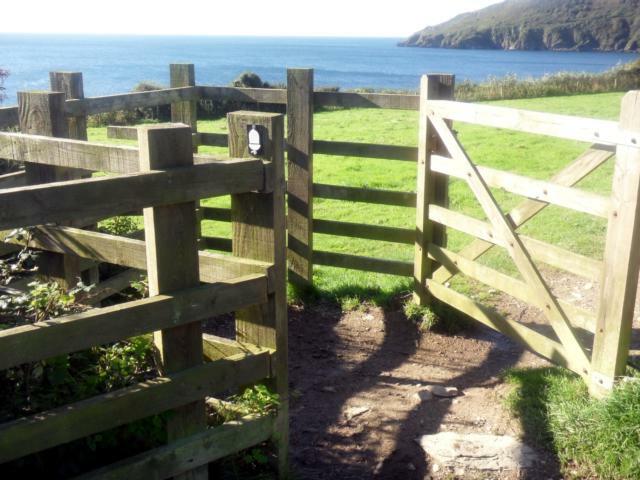 When the road ends beyond Hannaford, then the Coast Path continues for a couple of fields through two gates before the path becomes very difficult for wheelchairs and pushchairs. 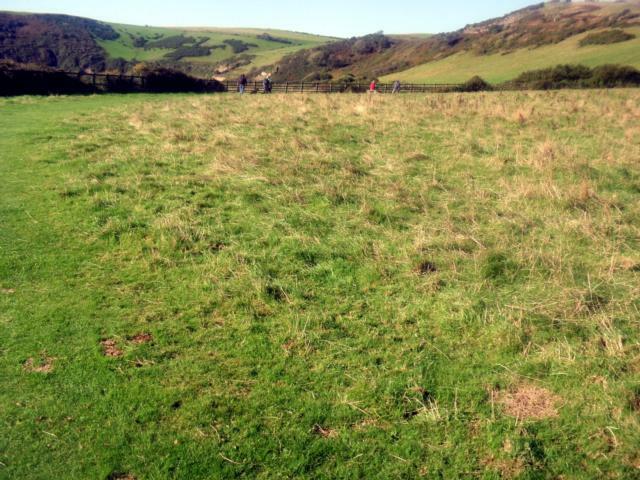 The fields are eminently passable with short grass and a reasonably level surface. Back in West Looe, there is one section where the coast path goes up some steps but by keeping to the road and going up a gradient of 1:15 for about 100m you can avoid the steps. 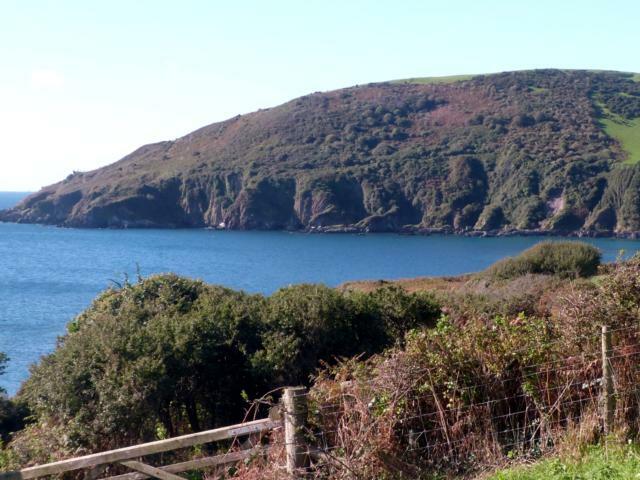 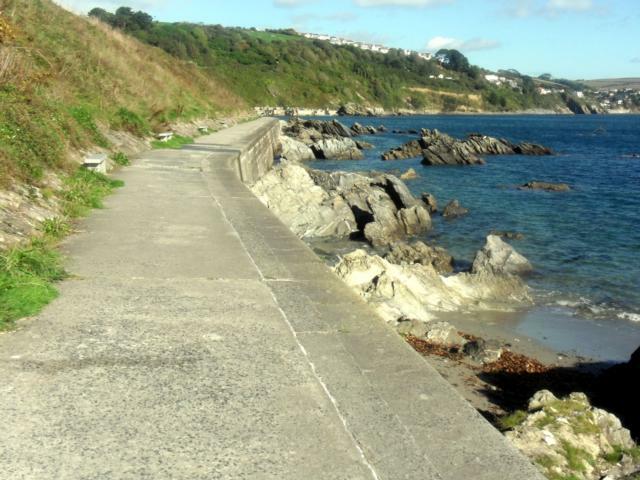 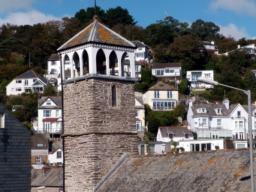 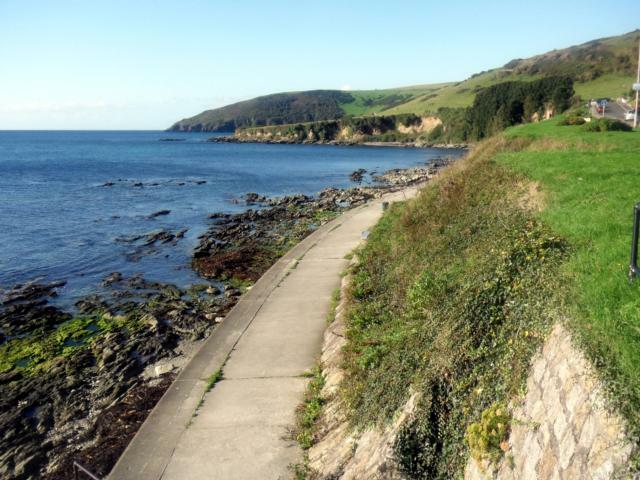 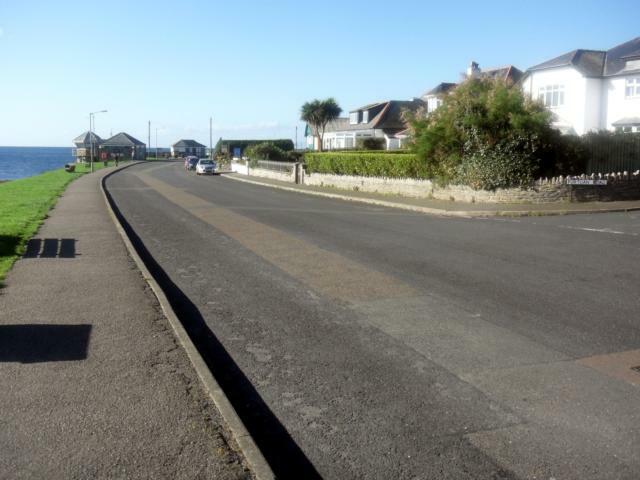 This road leads to stunning views of Looe and the river and is well worth the effort. 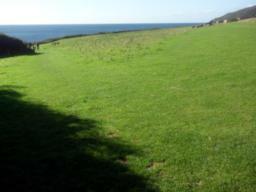 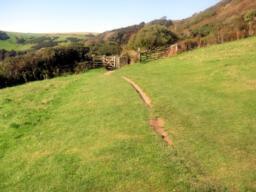 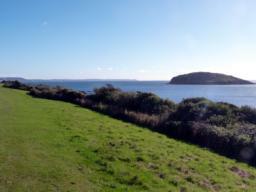 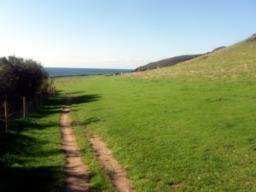 Further on, the views from Rame Head, to St Georges Island and on to Portnadler Bay are wonderful. 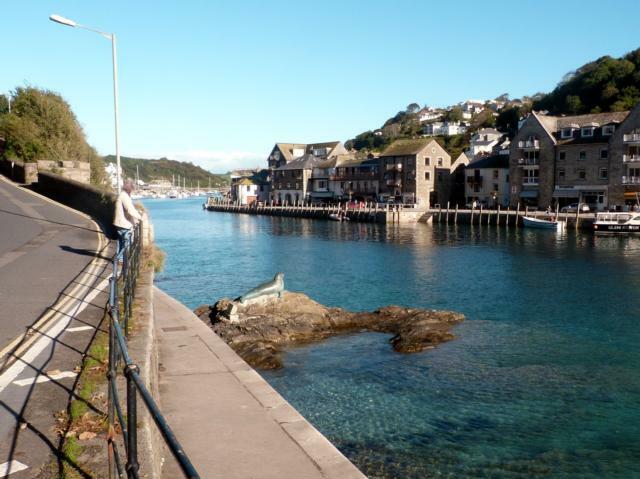 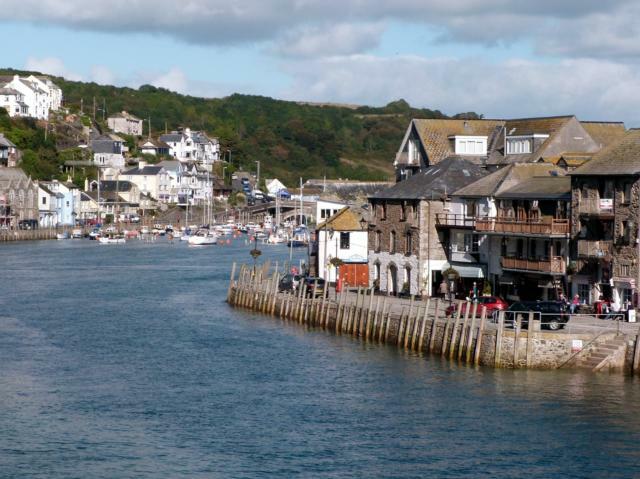 Public Transport: Looe can be reached by bus from Plymouth, St Austell and Polperro. Trains run between Looe and Liskeard which is on the main Penzance to Plymouth line. 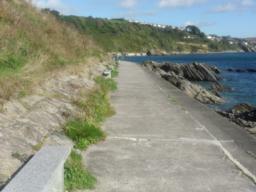 For timetable info visit Traveline or phone 0871 200 22 33. 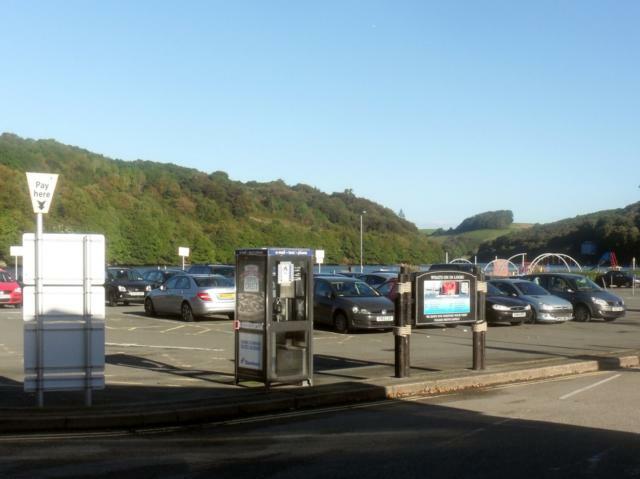 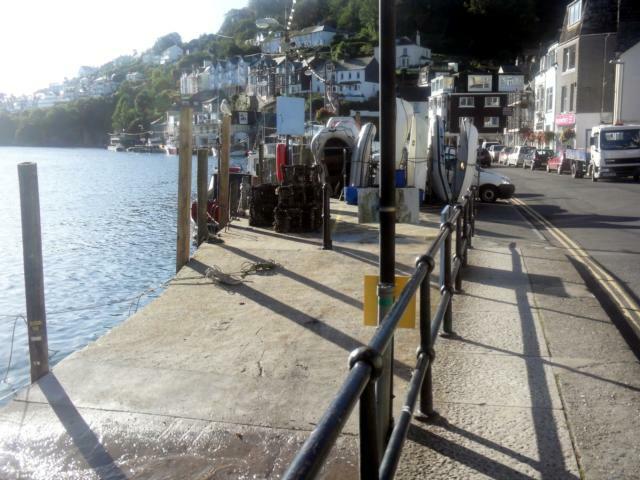 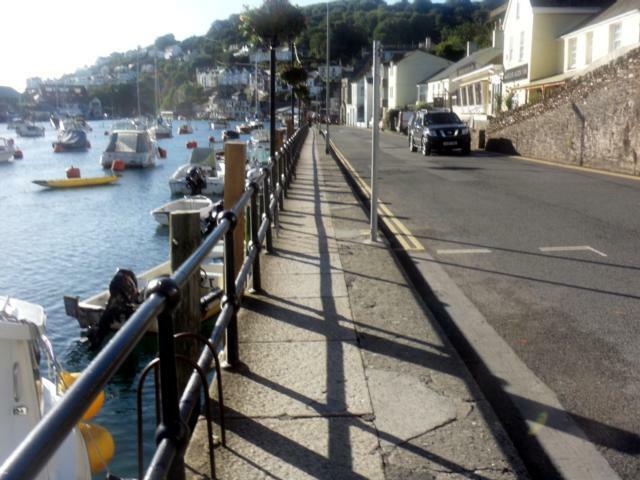 Car Park: Millpool Car Park, West Looe - PL13 2AF. 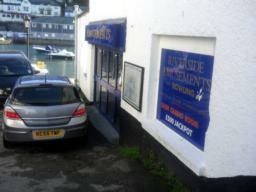 Fee payable. 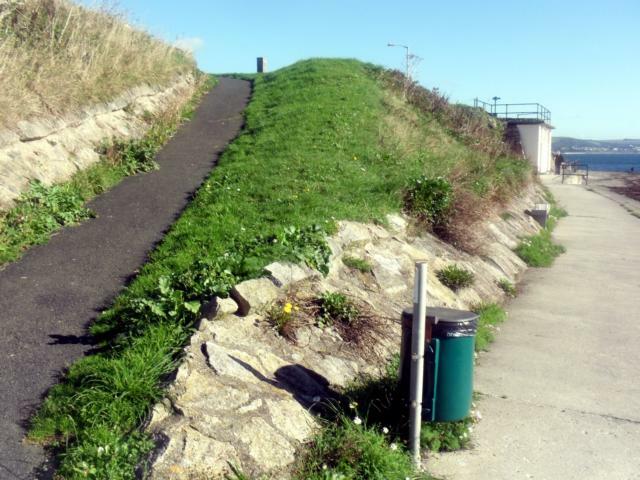 Steps: There are steps where the SWCP re-meets Hannaford Road but a short diversion on Hannaford Road avoids them completely. Barriers: The are gates between the 2 fields and at the end of Hannaford Road. 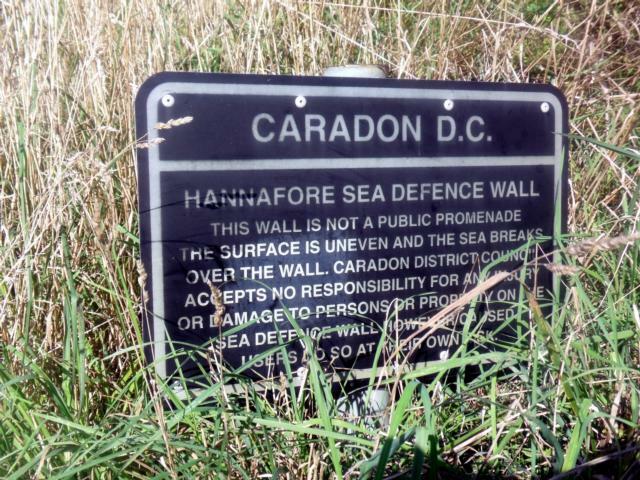 All are passable with care! 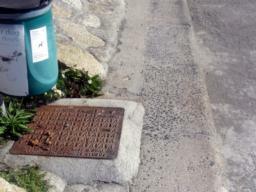 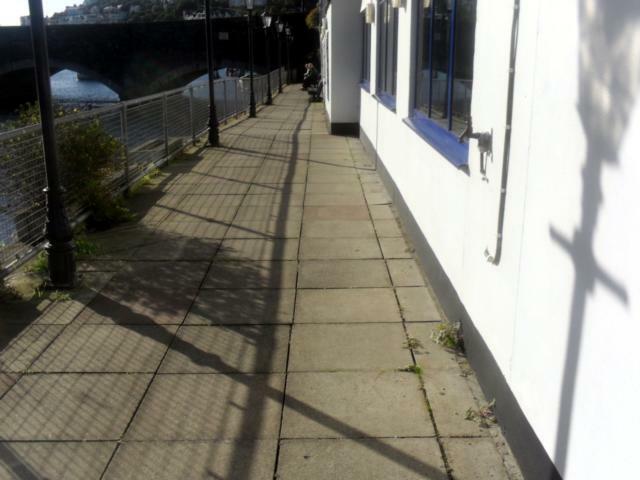 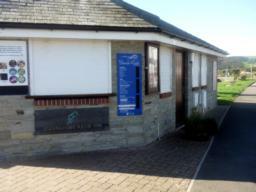 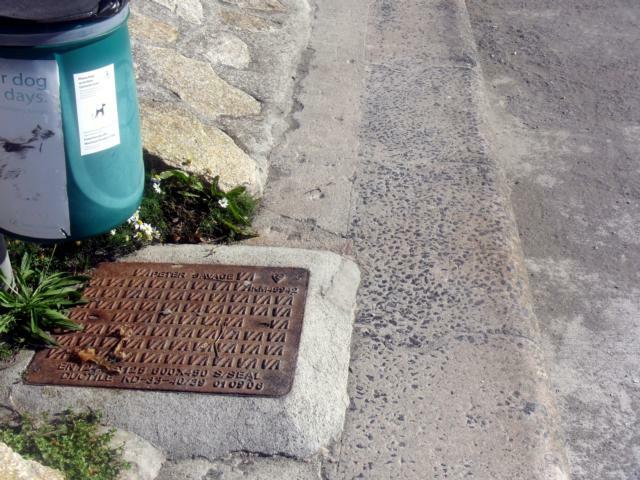 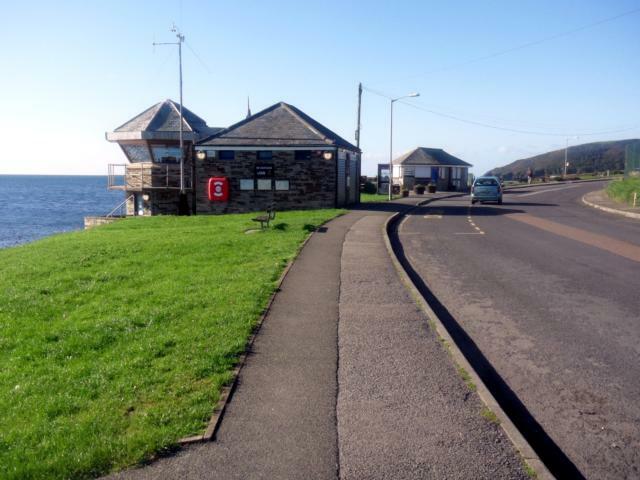 Toilets: Millpool and West Looe. 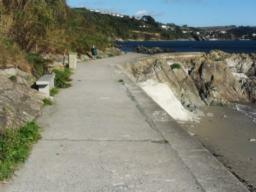 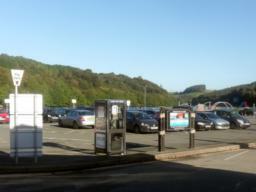 Millpool Car Park, West Looe (PL13 2AF). 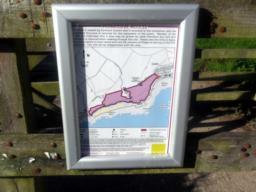 Fee payable. 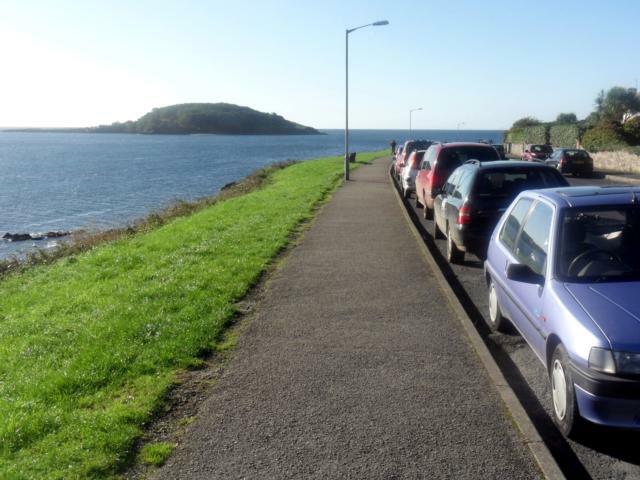 All Blue Badge users must display a valid blue badge with Time Clock set at time of arrival. 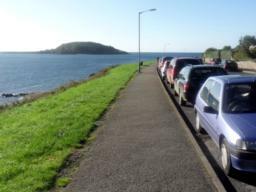 One Hour Free - Blue Badge holders paying a car park charge automatically gain entitlement to one extra hour of free parking in addition to the time allowed. 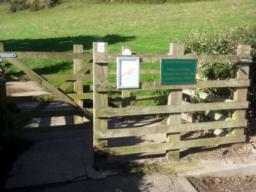 Turn left out of the car park on the side road towards the bridge. The path comes out on the riverside. 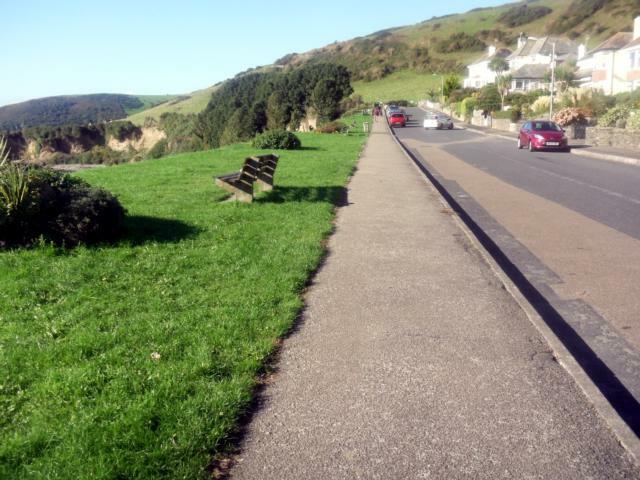 There are plent of seats at regular intervals all along this walk! The South West Coast Path keeps to the riverside. 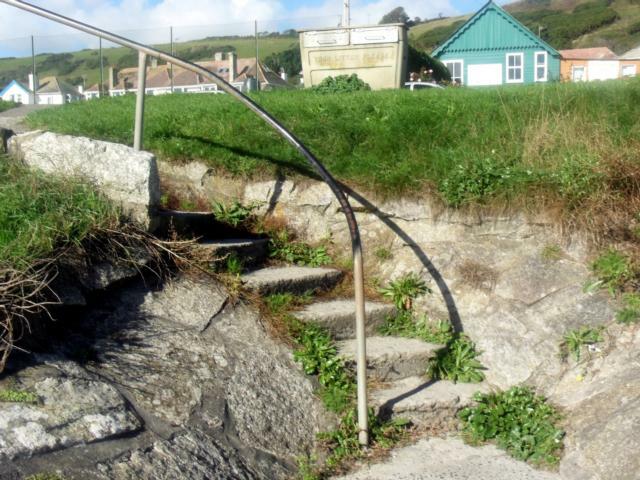 Beware though- there are steps up ahead. 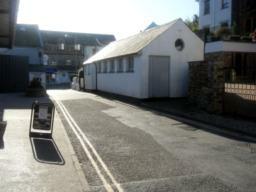 An alternative route is to follow Hannafore Road to the left of this building and past the clock tower on your left. 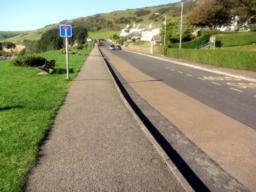 Looking back at the clock tower as you climb Hannafore Road- the gradient is 1:15 but for no longer than 100 metres. 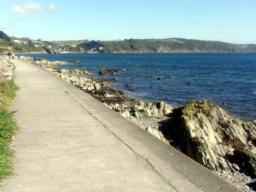 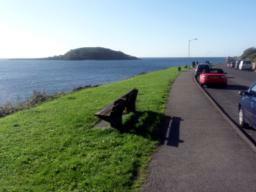 The view back towards Looe Bridge from Hannafore Road. 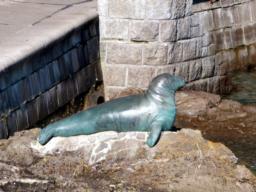 As you walk along beside the harbour, note the bronze statue of Nelson, a one-eyed bull seal who was a familiar sight around the harbour for 25 years before he died in 2003. 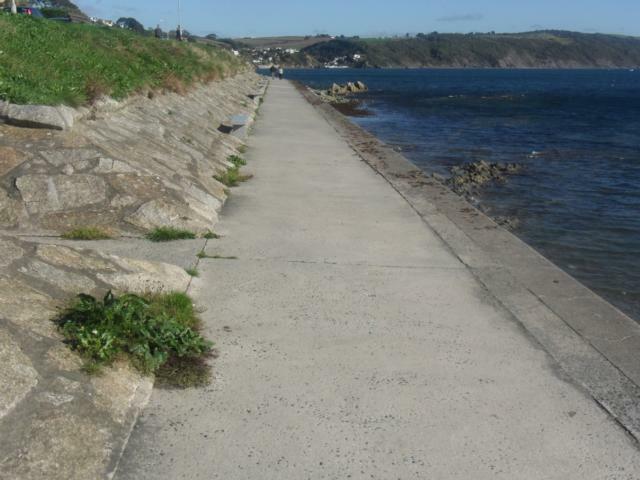 During the 19th century, local engineer and entrepreneur Joseph Thomas designed the banjo pier to prevent sand from silting up the river. His solution was so successful that the idea of a banjo pier was adopted elsewhere in the world. Just offshore can be seen Looe Island, also known as St George's Island. 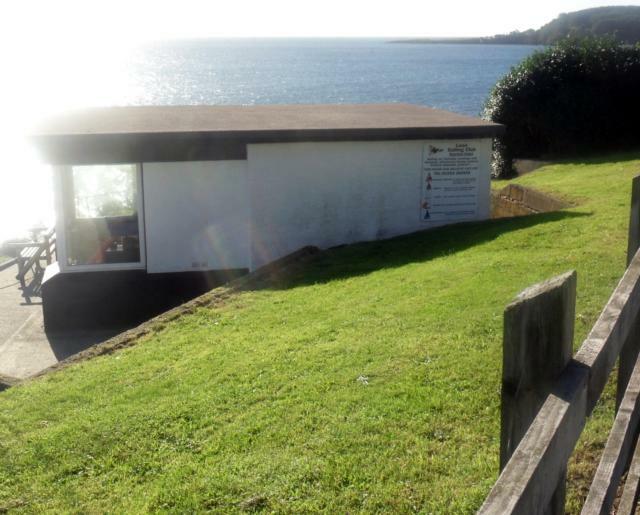 There is a medieval chapel on the island, which was dedicated to St Michael, although this was later corrupted to St George. A view showing the lower path by which you can return. 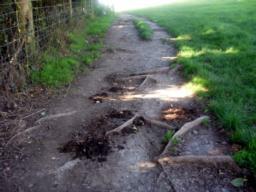 The surface is now grass worn in places near the gate to expose tree roots. The next 2 fields are easily passable. You don't have to stay on the path. 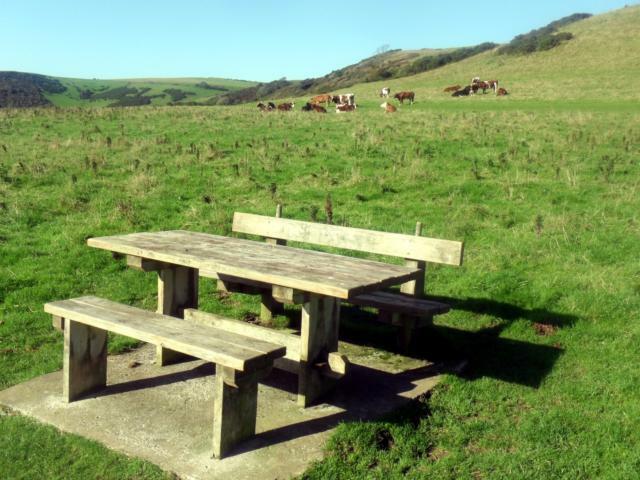 A picnic table beckons those with food and drink to consume. 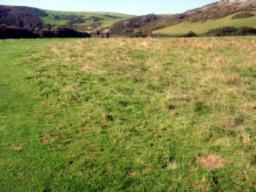 Up a gradual incline to the next field. Again - check the best route up to and through the gate. 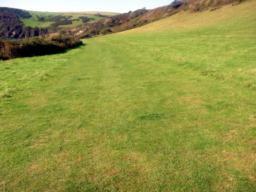 The path heads on a level gradient through this next field. 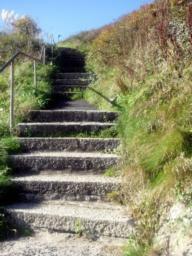 .... becomes narrower with a stony surface leading to steps. 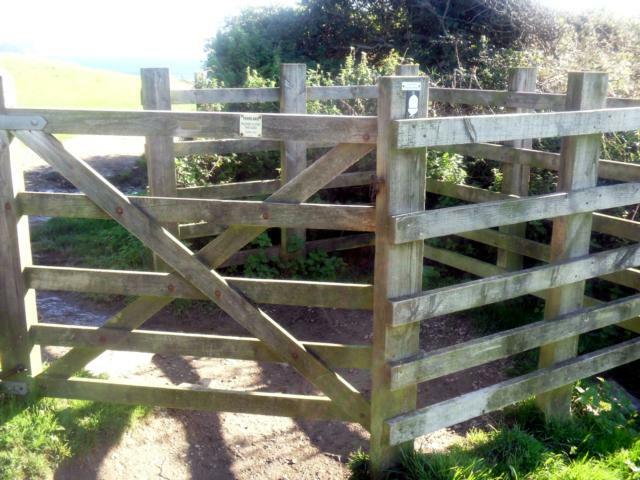 Back to the gate separating the first and second field. There was a medieval chapel on the island, dedicated to St Michael. It was a popular place for pilgrimages; but so many people drowned trying to reach it that a new Benedictine chapel was built just across from it on the mainland, sometime around the 12th century. 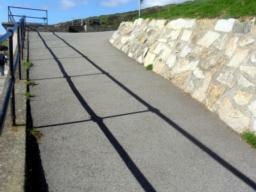 However, an alternative route back can be had by turning right, after the gate, and heading down this incline. The downhillgradient is about 1:15 and lasts for about 25 metres. Turn right at the foot of the slope and follow the path. 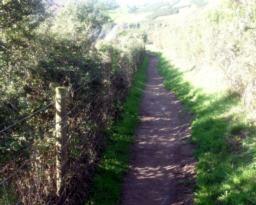 At regular intervals there are pathways back up to Hannafore Road. 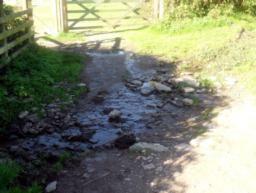 Sometimes the path up to the road is less accessible! The rocky beach at Hannafore is a popular place for rockpooling. The rocky reef exposed at low tide consists of beds of flat slate scored through by deep gullies, providing a habitat for many different species. 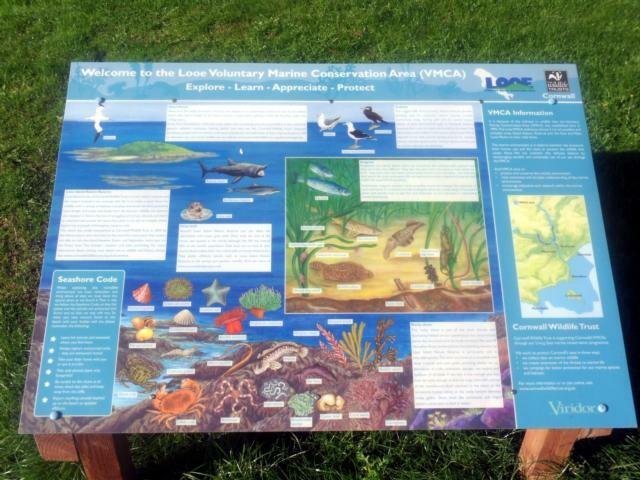 These include sponges, sea-squirts and sea anemones, as well as furrowed crabs, scorpion spider crabs and hairy crabs, and squat lobsters. The last slope back up to Hannafore Road. You can continue to the end of this path and return to here to get to the road. 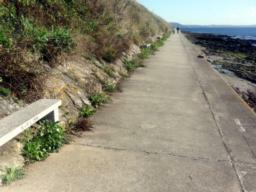 These rocks are called The Blind. 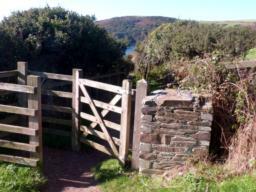 These steps lead up to the road at the end of the path. 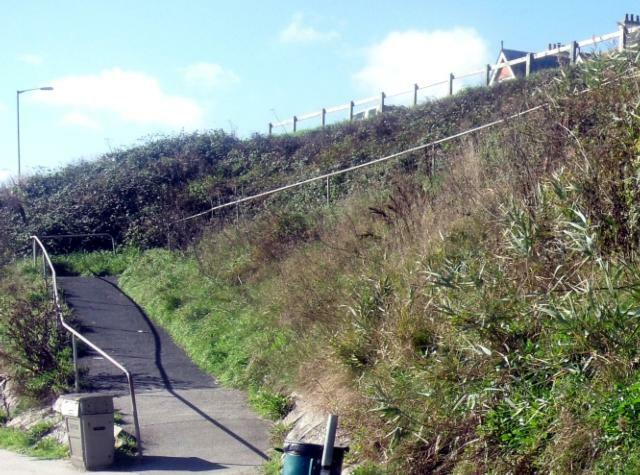 You may wish to return to the previous slope. 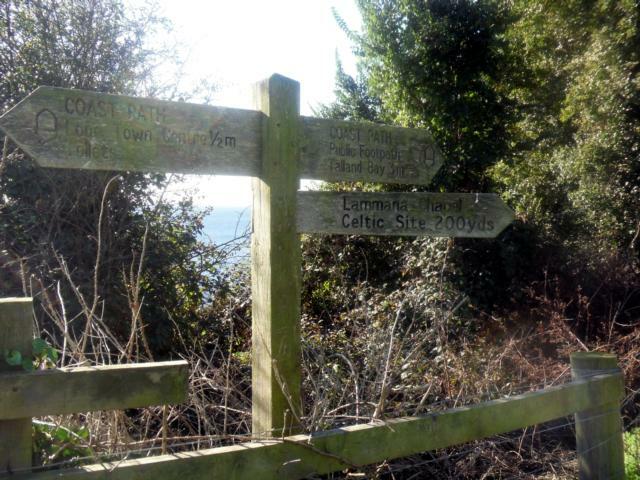 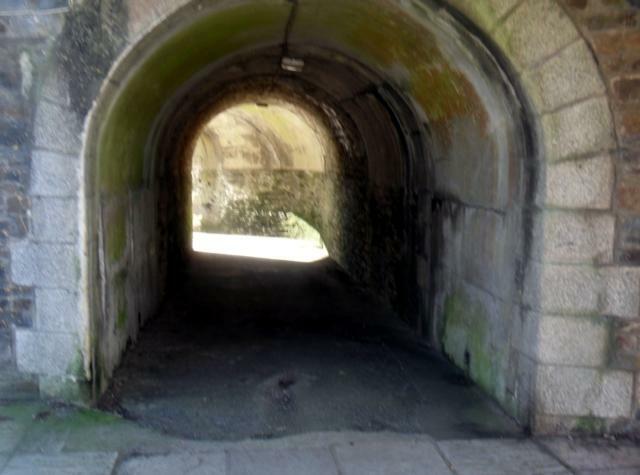 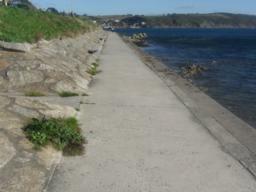 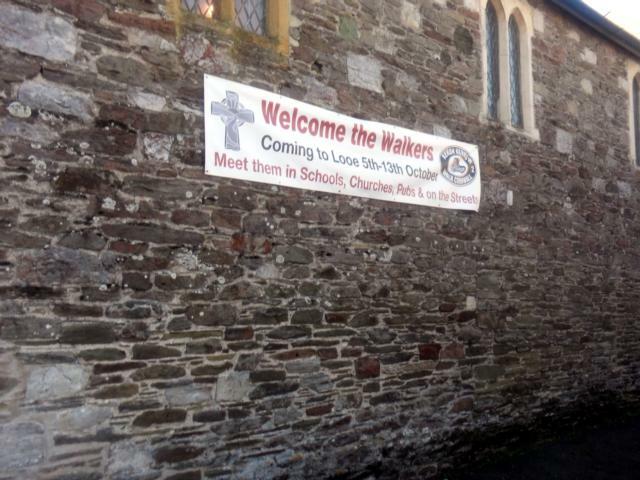 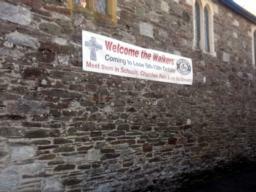 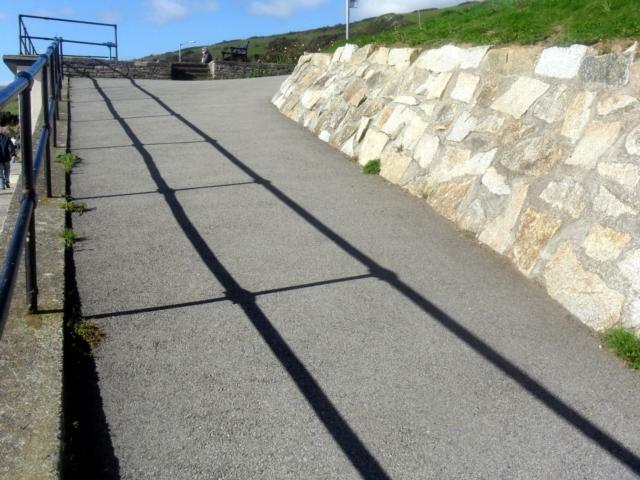 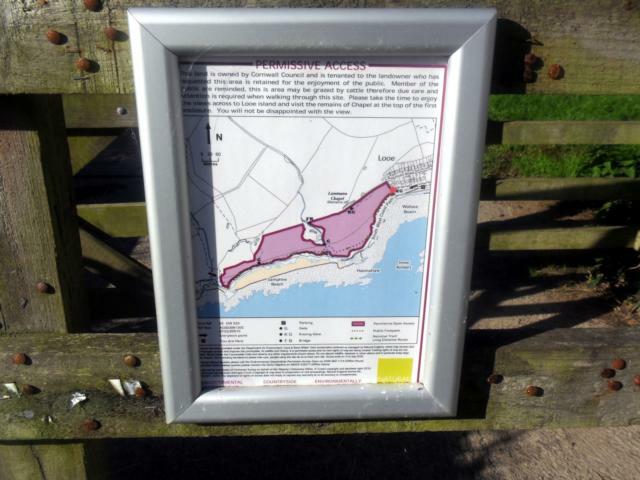 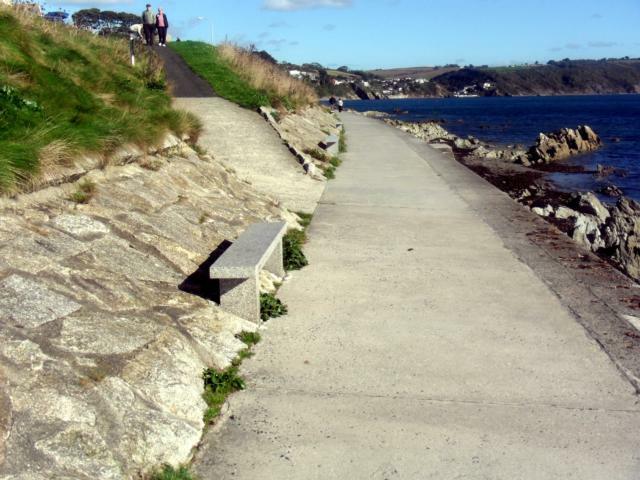 Once back on Hannafore Road retrace your steps through West Looe and back to the car park.